This month we stuck around in Costa Rica, but moved the roasting to Italy. Francesco Sanapo from Ditta Artigianale is roasting this month, taking care of “El Diamante”, a uniquely anaerobic processed coffee from Carlos Fernandez Morera, in the West Valley of Costa Rica. This is a super-cool and very exciting coffee, full of spice, sweetness, and apple pie. The genetics of Catuaí trace back to a cross of Mundo Novo and Yellow Caturra varietals, themselves natural mutations from Heirloom Bourbon seeds … which was a natural mutation of Typica, which most consider the original variety from which all varieties either mutated from or were genetically modified from. Just know most beans you try have a messed up family past … Catuaí was developed by the Instituto Agronomico do Campinas in Brazil in 1949, and into the 50’s and 60’s. This is a classic Central American combination, resistant to wind and rain with high yields, and often referred to as a dwarf or semi-dwarf. Pickers love this bean, as it’s easy to pick! 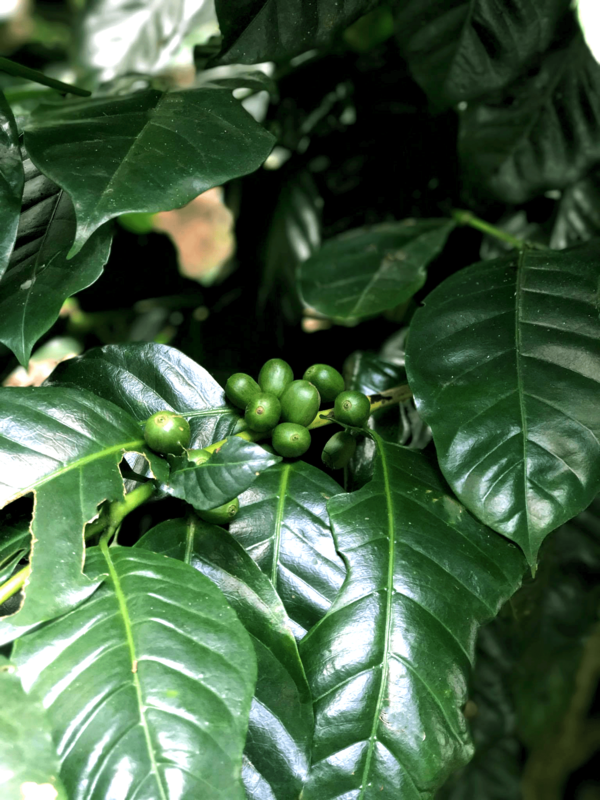 The beans were carefully picked at their optimum ripeness, then transported to the Café de Altura San Ramon wet mill, where the coffee was pulped. Previously chosen mucilage was added to an airtight tank along with the beans and a little water, before the anaerobic fermentation process started. Fermentation went for approximately 24 hours. The coffee was then dried on the patio for 3-4 days before placed in shaded African-style raised beds for about 18-20 days. Anaerobic, by definition, requires the absence of free oxygen. So anaerobic fermentation can be thought of as a benign form of rot. This would be distinct from the oxidative rot of, say, the banana you left in the fruit bowl for a week … Anaerobic fermentation is a neat biochemical trick, and one of the oldest forms of food preservation there is. From the first mistaken bowl of honey water turning to mead, or a bunch of grapes ageing into vinegar, to a pile of rotten fish (gross!) turning into fish sauce; fermentation has long transformed various forms of food into something delicious. With coffee, the fermentation process has been used to separate the mucilage (the fruity layer of flesh surrounding the coffee cherry, between the outer skin and the parchment layer) away from the bean, or seed, itself. Coffee growing regions with access to water use fermentation during the washed process to achieve this separation. Under water, free from oxygen, the fermentation process breaks down the cells of the mucilage, making it easier to remove it from the bean. Through that neat trick of biochemical magic, this process also teams up with the microorganisms in the mucilage, transferring flavour from the mucilage to the bean. Think complex acidity, spice notes, and sweetness. It’s not just the microorganisms and mucilage that team up either. They produce biochemical processes one after the other, each one tagging out once they’ve completed their mission. Hydrolysis, acidogenesis, acetogenesis, and methanogenesis are the technical terms for these chemical processes, which helps illustrate just how complex this entire process can be. While anaerobic processing is essentially the washed process, it’s perhaps better to think of it as the washed process — turned up to eleven. A small amount of water the beans were initially washed with is added to the mucilage. This is then combined with the beans in a hermetically sealed container, entirely free of oxygen. The chemical reactions formed by the anaerobic process lead to differing pH levels, temperatures, pressure, and sugar levels. This is where the processing departs from traditional washed processing, as all these levels need to be carefully monitored and maintained — and that takes a lot of skill. It’s a marriage of science, technology, and craft, that results in a unique and super-cool cup of coffee. In other words — a quintessential Superlatives. Carlos is no stranger to quality — his past two crops scoring third and fourth place in the 2016 and 2017 Costa Rica Cup of Excellence, respectively (that’s right — “El Diamante” came fourth in this year’s Costa Rica COE!). The farm was originally acquired by Carlos Morera’s grandfather, Santiago Fernandez, at the start of the 19th century. The farm was mainly used to raise cattle while also cultivating tobacco, sugar cane and potatoes. Mrs. Luisa Paniagua, Carlos Morera’s grandmother, took over running the farm upon the early death of Santiago Fernandez. At a time of few rights and very little equality for women in South America (and globally!) Mrs. Luisa Paniagua raised her six children on her own while running the farm. Coming out of the then recent change from the pastoral/feudal society, to the colonialist coffee-driven capatalist society from 1850 onwards, this would have been an immensely difficult challenge on her own. While seven years ago Costa Rica elected their first woman president, Laura Chinchilla, there is still a large problem of economic incorporation of women within Costa Rican society. The depressing wage gap between men and women is alive and well in Costa Rica, with some women still performing work as informal labourers (many on coffee farms). Within this current culture it’s hard to imagine truly how tough it must have been for Mrs. Luisa Paniagua, when she first took over the farm over a century ago. Women been doing it for themselves for a long time. Not only a quintessential Superlatives — but also dedicated with love ???? Crashing and burning coming dead last in his first ever Barista Championship, Francesco Sanapo came back with determination and a newfound humility to take out the Italian Barista Championship three years in a row. He now heads up Ditta Artigianale in Florence. We’re pretty happy to leave“El Diamante” in his skilled hands for all our subscribers this month. He was kind enough to spare some time for a chat with us, which you can find here. Barista Hustle’s own resident Queen Hypebeast, Michelle Johnson, put together a neat Kalita Wave video for you to enjoy. Bonus points galore for music choice here — but honestly: what else would you use? There’s a 75g bloom in there, a bunch of spiral pours, and we can’t have a coffee roasted in Italy without a little Prosecco downed in there too ???????????????? Nothing changed with the usual parameters: low pressure at 5.5 bars, 18g dose in 18g VST basket, ~38g beverage weight, 20-25 second shot time, 10kg tamp force, 90°C brew temp, with frozen beans ground straight from the freezer. The fun thing to play around with here is either speeding up your shot times a little and extending the ratio out to 1:2.5 or :3. The acidity is a little more pronounced but the dilution really balances out the crisp apple of this coffee. Ramp your brew temp up a little, make sure your distribution in the basket is on point, and you can squeeze out a classic 1:1.5 and really expose the spiciness and apple pie aspects of this coffee. At whatever ratio it simply remains a delightful cup to drink. This is as true for filter as it is for espresso — this coffee is a delight. Unique, distinctive, and so enjoyable; we hope this hits all the marks for what you’d expect from a Superlatives coffee. Let us know what you think in the comments below!